Chinese military planes flew into Korea's air defense identification zone 140 times without notifying Seoul last year, often near Heuksan and Ulleung islands, where there is no overlap with any other zones. It was the first time that Chinese military aircraft entered the zone at a point without overlap, and the repeated disregard for international aviation protocol is raising concerns that China is deliberately flexing its military muscle in the region. 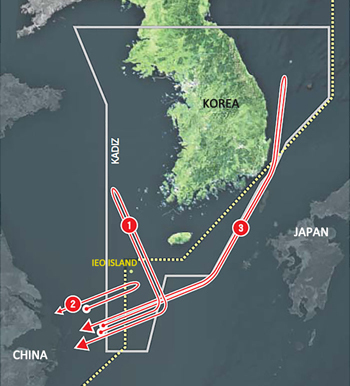 Until 2017, China's aerial incursions were mainly focused in the skies over the submerged rocks of Ieo, where the zones of Korea, China and Japan overlap. Air defense identification zones are not territorial airspace but require incoming planes to identify themselves to the county that claims them. International practice is for foreign military and civilian aircraft to seek permission from military authorities of the other country 24 hours in advance. According to Liberty Korea Party lawmaker Baek Seung-joo, who was briefed by the Defense Intelligence Agency, Chinese military aircraft flew into Korea's zone in the West Sea 65 times last year. 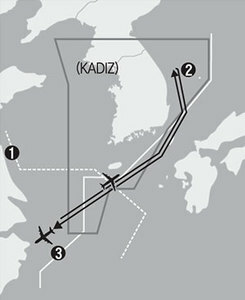 In some instances they flew as far north as Heuksan and Jindo islands. They also intruded into airspace over the East Sea in addition to the southeastern zone over the Dokdo islets. The number of violations rose from around 50 in 2016 to 80 in 2017. Where the Korean and Japanese zones overlap, both countries scrambled fighter jets, resulting in 10 to 20 Korean, Chinese and Japanese fighter planes converging over Ieo, Jeju and Daema islands for hours at a time. One intelligence source the coat-trailing appears to be aimed at gauging Korea's military readiness and response. "China is trying to expand its military clout in the West Sea as well as the East Sea, so it's only going to get worse," Baek said. One military source said, "China's incursions into KADIZ in the East Sea happen almost every month. It looks like China is holding regular training exercises along that route." China also placed buoys near Korea's exclusive economic zone in the West Sea. "The incursions are in effect a violation of our territorial rights," Baek said. "We should take a calm approach, but firm steps need to be taken if they continue."